Hans Harry Tobias was born on november 29, 1921 in Gießen to Julius Tobias and Lementine „Lilli” Löwenberg. Lilli’s parents Louis and Johanna Löwenberg lived in Schupbach near Limburg, today part of Beselich. Julius‘ mother Rosa also came from Schupbach, her mother was Klara née Löwenberg. Lilli had worked at the department store Salomon in Weilburg until she married Julius Tobias. The marriage was broken short after the birth of their son Harry and Julius went back to Hamm, because he felt mistreated by his parents in law. Harry was the youngest jewish child in town and his grandmother Johanna was the last one burried in the jewish cemetery in spring 1938. The family suffered from the boycott of their cattle- and furtrade at Schupbach. After the pogrome in november 1938 the 71 year old grandfather Louis was interned at Buchenwald. The jewish women and children were kept in an old mill outside of town for several days. After his release in december 1938 Louis Löwenberg moved to Frankfurt with his daughter Lilli and his grandson Harry. 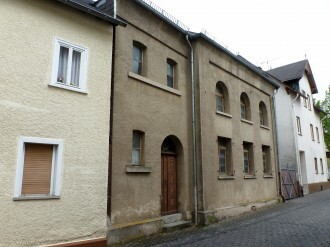 The insufficient proceed from the sale of his house in Schupbach didn’t last out to assure Louis declining years at the jewish senior home of Frankfurt. He worked at the municipal timber yard until 1941. He died in 1942 from an apoplectic stroke and following up a rumour he’s been slayed at work. Lilli was deported to the east in 1942 and considered missing. Harry at first came to a labor camp in Frankfurt, but in october 1941 got to Barcelona. In february 1943 he was interned at the camp Miranda de Ebro by the Gestapo and freed two months later. In july 1943 he finally managed to emigrate to the USA via Lisbon. 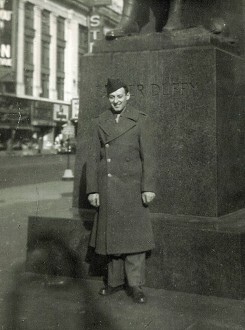 On february 24, 1944 he joined the US Army and after the war settled at Hartford/Connecticut as a carpenter, where his father Julius lived since 1937.